Salmon aficionados will once again be looking forward to catching 3- and 4-year old kings in the ocean when the Oregon KMZ opens May 19. Salmon fishermen of the KMZ, it's time to start counting backward and marking days off your calendar. Due to a decision that finalized salmon alternatives at a recent PFMC meeting held in Portland, Oregon, both California and Oregon Klamath Management Zones (KMZ) will be fishing long and hopefully productive ocean salmon seasons this year. The reason for the long salmon seasons was in large part being able to fish for salmon in the KMZ, an area that houses salmon that originate from California's two largest rivers: the Sacramento River and the Klamath Rivers. The California KMZ, which spans the ocean from the California/Oregon border to Horse Mountain (just south of Eureka), has a 95-day season that lasts from June 1 through September 3. The Oregon KMZ, which encompasses an area from Humbug Mountain (just south of Port Orford) to the Oregon/California border will have a 100-day season lasting from May 19 through August 26. "What this means is that we get to go kill 'em, and I'm excited as all get out," said Gary Blasi, owner of Full Throttle Sportfishing in Eureka, California. "Normally we start in early-May or mid-May, so really we only lost between 15 and 30 days. "So I'm not complaining whatsoever," Blasi noted. "We have a lot of opportunity this year, especially with all the California halibut. They're already being caught in San Francisco, so we know we're just loaded with them up here. So we have a live-bait fishery for that, we have king salmon, Pacific halibut, rockfish and then maybe even some albacore. It will be a banner season; there should be no days off the water." 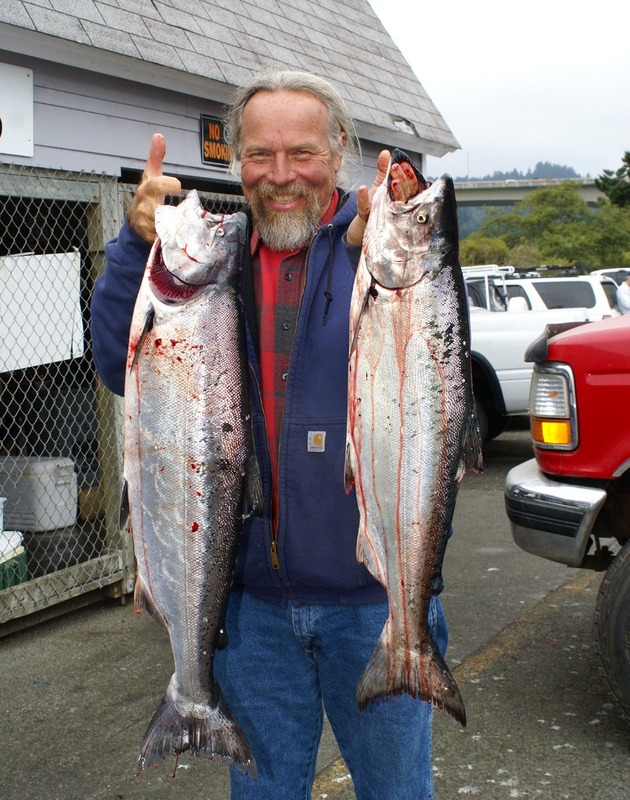 In about one month, Oregon's KMZ will be opening its doors to the May king fishery, with most fishermen launching their boats at the Port of Brookings Harbor. If by happenchance (and it does happen) that the fishery should be stellar out of Crescent City Harbor, then anglers will be towing their vessels 30 miles south on Highway 101 to get their Chinook outside of California's northernmost harbor. And on the extreme outside chance should Humboldt Bay be going off like gangbusters, anglers will be towing their vessels 100 miles south on Highway 101 to launch at places like the Samoa Boat Ramp to get their 'Nooks out of Humboldt Bay. All an angler needs to do is to buy a fishing license for the respective state in which they are fishing. "It should be a great season," says Captain Jim Bithell of Charthouse Sportfishing in Brookings. "All we need are the fish to go with the season and were golden." "We had a strong day on Monday on springers, on the lower 8 miles of the river," said Jim Carey from the Rogue Outdoor Store in Gold Beach. "Virtually from Orchard Bar downriver had action on all the gravel bars, and pretty much everybody had some action across the board." Carey said there was very little action above Orchard. Fish were moving upriver with the incoming tide. "I will say we had a concoction of both spring Chinook and some late-run winter steelhead," noted Carey. "A couple of guides had dropped out about 8 times and then on Tuesday we also had multiple guides dropping out - dropping out with 4 fish!" When we talk about guide dropping out, we're not talking about dropping out of school, although it does happen to be spring break. The 'dropping out' lingo specifically refers to fishermen having to break away (dropping out) from anchor to fight their fish, which 99-percent of the time is a spring king. As dedicated springer anglers know, a springer fights about 10 times harder than a regular Chinook and can spool you in less than a minute. So if you aren't ready to drop out on a springer at a moment's notice, you might as well be fishing for bluegills. "So springer fishing is finally in gear - plus we also had a late shot of winter steelhead," emphasized Carey. Anglers of the salt also were able to slay limits of rockfish and lingcod on the few days out of the week that provided flat, mirror-like qualities. Once again, it didn't take anglers long to limit out on the bottom-grabbers at the Port of Brookings Harbor, and most anglers were off the water within 2- to 3-hours. Whatever your favorite lure is, by all means use it because the rockfish are scarfing up everything in sight. Trout anglers also limited out on large rainbow trout caught at Garrison Lake in Port Orford. The most popular bait of all time is rainbow-colored PowerBait, but those who know the nuances of how to keep a cocktail marshmallow on a treble hook also caught multiple 'bows at Garrison. Dungeness and Bottomfish Galore - Rogue Springers on the Way!